This fresh tasting raspberry flavour is delightfully juicy. With an authentic fruit taste in every drop, it is a real crowd pleaser. Only made with the highest quality ingredients, you can count on this syrup to give a gourmet experience every time. The sweet flavour is balanced out with a subtle tartness, making it perfect for those who don’t want anything too sweet. 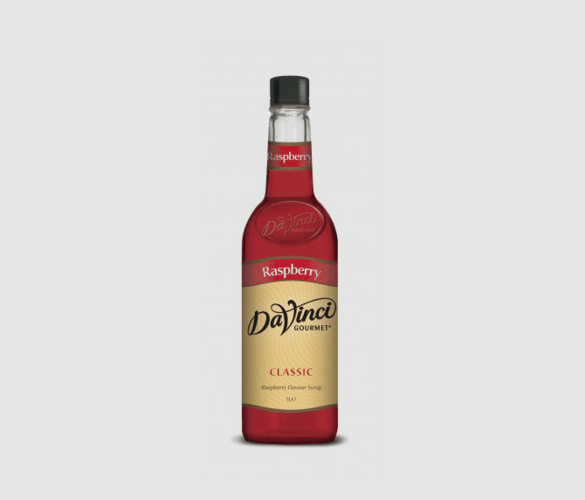 Bring this refreshing raspberry taste to any drink recipe and it is sure to impress. A little splash goes a long way, so experimenting with recipes and flavour combinations is easy. Achieve a real fruit taste without comprising the texture of your creation. DaVinci have always been committed to using the highest quality ingredients in their products. This syrup is made from pure cane sugar which gives it the perfect sweet taste. Enhance your menu and appeal to a huge audience with this widely popular syrup. The possibilities are endless and will excite customers. Also benefit from the user-friendly plastic bottle which is easy to use and a much safer option. How Can I Use Raspberry Coffee Syrup? This gourmet syrup has been specially formulated to resist curdling with dairy products and to withstand high temperatures, so this is a product you can rely on when creating recipes. Coffee – This juicy flavour will work great in your coffee. Tea – Raspberry works so well in so many flavours of tea and the best part is being able to experiment. Try different combinations in hot or iced tea. Lemonade – If you haven’t tried raspberry lemonade, we highly recommend that you do. This product makes it even easier to create this refreshing drink. Ice pops – Homemade ice pops are fun and delicious. Try adding a splash of raspberry syrup into the mix to sweeten things up. This raspberry mint iced tea is just as easy as it is delicious. The sweetness of the raspberry pairs perfectly with the refreshing mint. This is a great recipe to cool you down on a warm Summers day, or if you’re like us then perfect for dreaming of a warm Summers day! Fill your favourite glass with ice to chill. Brew your tea of choice and strain. Put the tea, both syrups and ice into a cocktail shaker (or any cup that has a lid) and shake vigorously. Take out the ice from the glass and pour in your drink. Garnish with a raspberry, slice of lemon and sprig of mint.